Quick and easy assembly plus adjustable surface tension - without snaps. 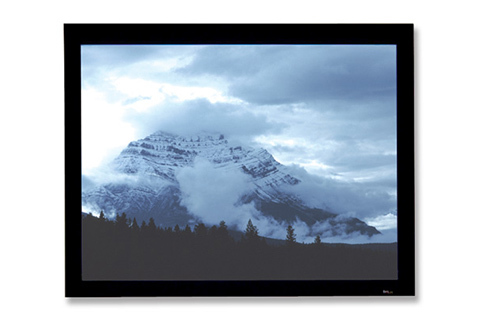 You can have a beautifully framed image hanging on the wall in just 10 to 15 minutes. Assembly is that easy! An attractive frame and a new fabric tensioning system make Onyx the leader in permanently tensioned screens. The 4-inch-wide beveled, extruded aluminum frame interconnects onsite with one simple hand tool that Draper provides. Each side piece slip fits tightly to injection molded plastic corners, forming perfectly mitered edges. A radical new approach to fabric attachment will amaze even the toughest of critics. There are no snaps! Uniform tension is applied to the entire surface area, so the surface is perfectly fl at. Unique fabric retention system enables you to adjust the surface tension (up to 1 1/2 inches) in just seconds, without tools.